At Addict Clothes we place great importance on pursuing the right materials. 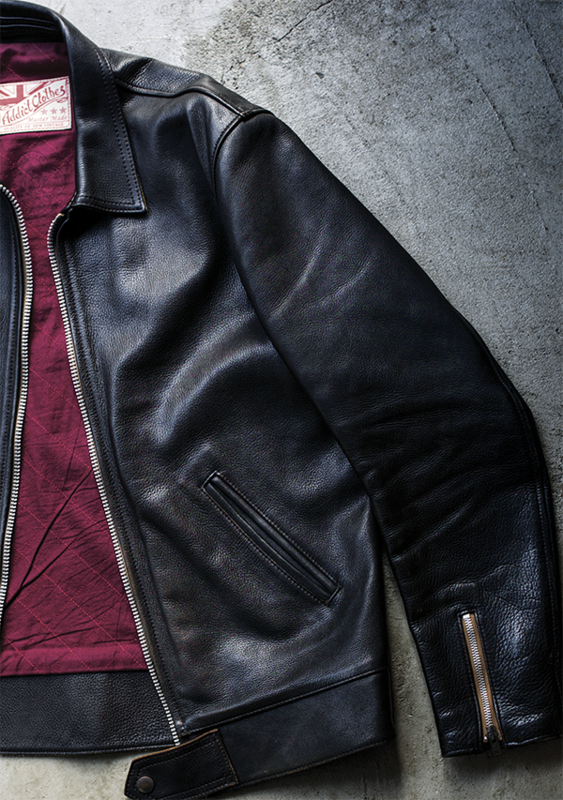 but we are especially devoted to what leather we use for our leather jackets. Our products are focussed around this key word.This is because no matter how hard we looked amongst the leather that is in general circulation these days we could find nothing to satisfy us. What we were after was something with the refined feel that vintage jackets gain over time. At the same time we needed leather that allowed us to make jackets that are comfortable to wear and make the wearer fall in love with them the more they are worn. This was the starting point from which we began to make our ideal kind of vintage leather. We worked with Japanese master tanners, endlessly repeating various tanning and colouring processes to finally reach our goal of creating our own original Addict Clothes custom-made leather. Sheepskin is a material that is synonymous with many British vintage motorcycle jackets. Motorcycle jackets were originally created to protect the wearer's body and so many of them use hard and heavy leather. However, many British-made jackets also exist that use soft and light sheepskin. Compared to cow and horse leather, sheepskin is lightweight, preserves heat well and also ages in a very unique way. We have long been attracted to this vintage sheepskin and so wanted to recreate something similar with our own products. I think that when most people hear "horse-hide leather jacket" they imagine some kind of tough American vintage jacket. However, though few in number, vintage British jackets made of horse-hide also exist. but many vintage jackets have hardened and most people feel a certain amount of discomfort when wearing them. The appeal of horse-hide is not only its lustre, but also its intrinsic fine-grained texture and suppleness. 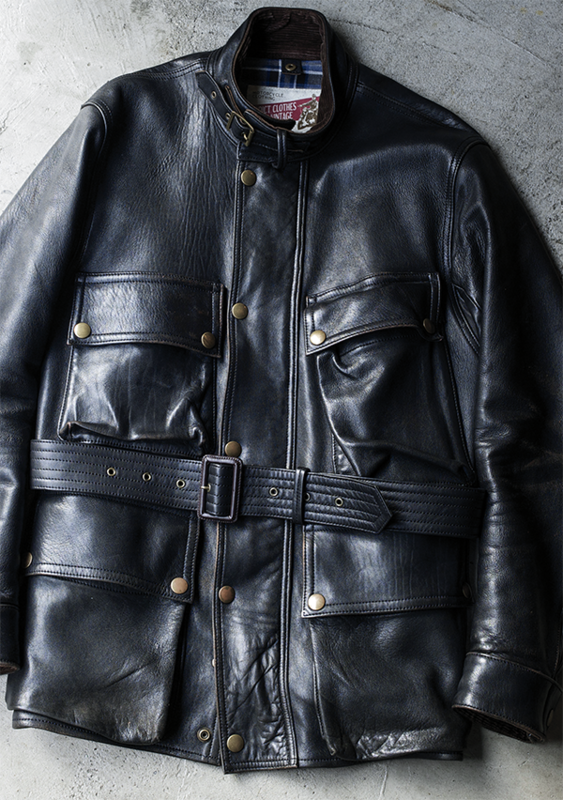 We wanted to make use of these original features of horse-hide to produce our own original UK style jackets. 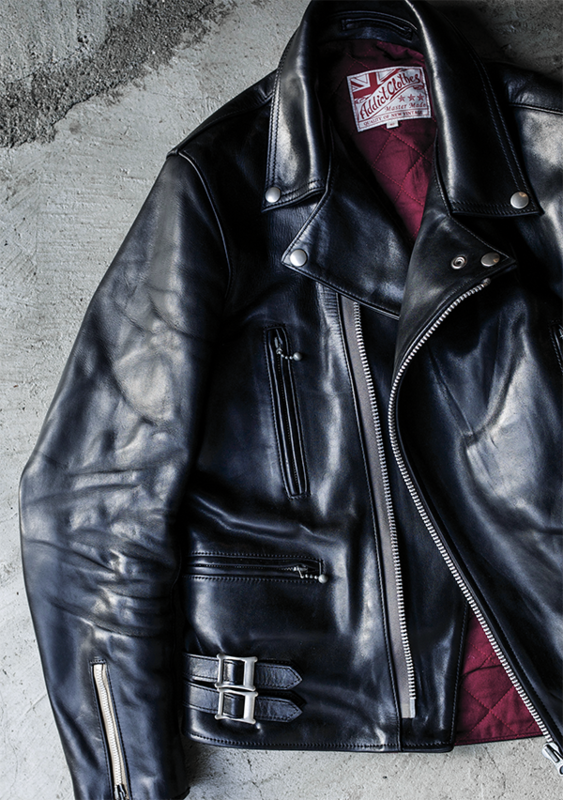 Since the old days cowhide has been the most widely used leather for motorcycle jackets. This is because not only is it abundant in terms of supply, but also possesses the toughness and durability necessary for protective gear. However in some cases this tough and durable leather becomes less comfortable to wear over time exactly because of these features. This is why we chose to recreate with our products a certain kind of cowhide that can be found amongst British vintage jackets that is strong and durable while at the same time flexible and comfortable to wear with a refined feel.